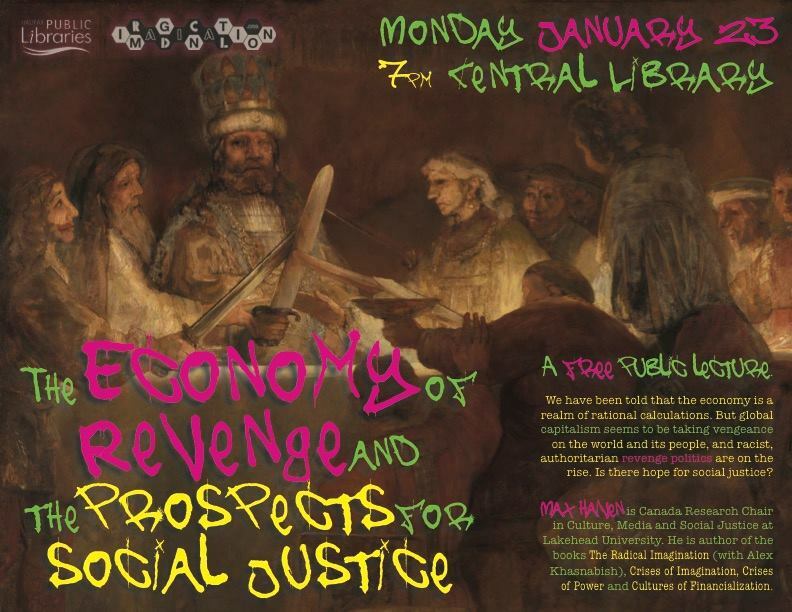 A free public talk by Max Haiven, hosted by the Halifax Public Libraries Central Branch and the The Radical Imagination Project. We have been told that the economy is a realm of rational calculations. But global capitalism seems to be taking vengeance on the world and its people, and racist, authoritarian revenge politics are on the rise. Is there hope for social justice? Max Haiven is Canada Research Chair in Culture, Media, and Social Justice at Lakehead University in Northwest Ontario. He writes articles for both academic and general audiences and is the author of the books Crises of Imagination, Crises of Power: Capitalism, Creativity and the Commons, The Radical Imagination: Social Movement Research in the Age of Austerity (with Alex Khasnabish) and Cultures of Financialization: Fictitious Capital in Popular Culture and Everyday Life. He is currently working on a book tentatively titled Art after Money, Money after Art: Radical Creative Strategies Against Financialization.